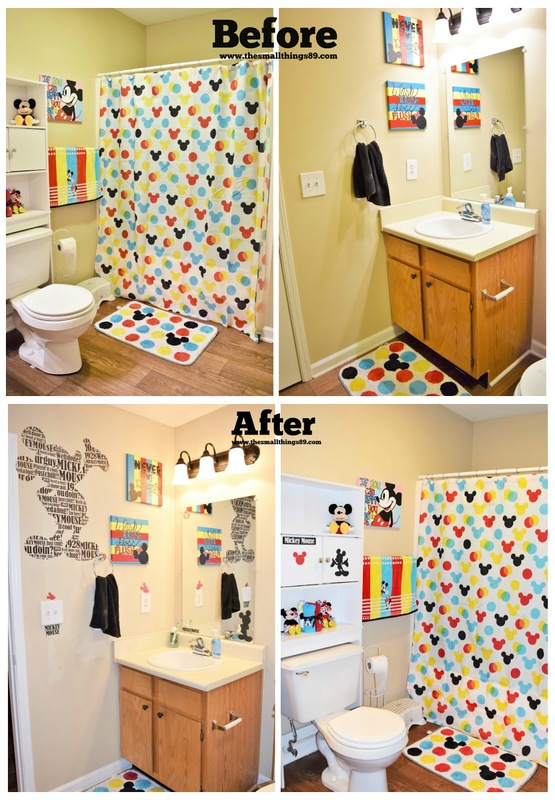 Mini Bathroom Makeover With RoomMates Decor- Easy Removable Decals! HomeMini Bathroom Makeover With RoomMates Decor- Easy Removable Decals! Scope out where you want it to go, make sure you apply on a clean and dry surface and place it. If you don't like where it is, or how you applied, you can peel and place again! I did this several times and I was stoked to see how sticky that it remained! I seen that they had the cutest Mickey Mouse Decal! They had three pages to look through filled with Mickey themed items! I chose this cute Typographic Mickey Mouse Decal. It had 17 decals included in the pack. As you can see, the before and after gives a small makeover and adds what was needed in the room. I needed that "last touch". Since we live in apartments, we cannot paint. This is just what I needed because they don't do any damage! RoomMates Peel And Stick Decor is my recommended GO-TO for any room accessory. The decals came on 1 sheet of 18" x 40". The mickey came in pieces and they had numbers to tell which went where. It was so easy to assemble! I do plan to move it to the right just a tad, I am still debating on that now. I was excited to see how that this came together, and I placed the mickey heads in the bathroom randomly. Some on the shelf above the toilet, on the mirror, wall and door. I am happy with the end result and I can't wait to WOW my guests when they come over. I even added some onto the bathroom mirror. This inexpensive makeover can be yours for only $18.49! That is such an amazing price, compared to what you would pay to paint, and repaint over it if you choose to change the theme! Visit RoomMates Decor on their website to see the other products that they have to offer to get you started on your room makeover. You won't regret it! You can also visit their social channels to stay up to date with the latest below! Do you plan to give a room in your home a mini makeover with RoomMates Decor now that you have seen my post? I would love to hear! Like this post? Pin the image below, or RT this tweet! Thanks for reading! Oh my goodness, so dang cute! I love how you decorated your bathroom! This is so adorable, you did a great job!! I love how that turned out! We have textured walls so I'm wondering if Roommates will work for us?! It turned out super cute!! I love it! So cute! You did a great job and those stickers look easy to use to make a real statement! I love the decals you choose. A perfect match! Plus, they really look easy to apply. I need to get decals for my daughter's bedroom. I have never thought to use decals in the bathroom I love the idea. I love the Mickey theme! I love how it turned out! It's cute and Disney is always fun as a theme! Those are such cute decals! It really brings the room to life! Those decals are really neat! The Mickey decals are so whimsical! You did a nice job. How cute! I think it is just adorable! You did a great job! I never thought to use these stickers in the bathroom. Cute! Wow! So awesome! I can see that You spent a lot of time to do it! 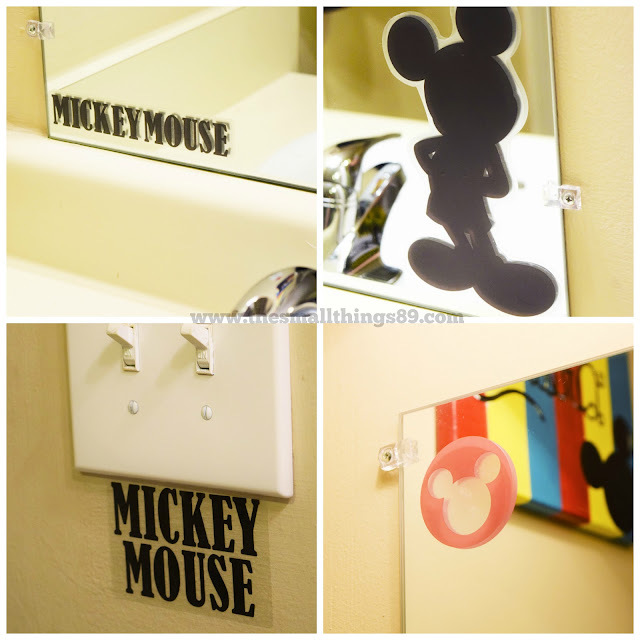 I love Your bathroom :) The Typographic Mickey Mouse Decal looks super cool, too! I love it. It's cute and colorful. I like the transformation. So bright and cheery! I love the transformation and I really wish I could envision what I want something to look like! Hearing how easy it was for you though gives me hope that even I could do something like this! These decals add such a nice touch! It is an easy and cheap way to transform a room! This is super cute. I love the Mickey Mouse theme. I can't wait to check out their website and see what other decals they have to offer! Great job, so cute, love the colors. I'm loving all the bright colors, that shower curtain is too cute! Great idea. Right now I have ducks in my bathroom and I've been thinking of changing it around. WOW, I LOVE IT. YOU HAVE A GOOD EYE. I like the mickey mouse decal. What a cute bathroom redo! You have an eye for design. Great idea! And you did a great job! I love the peel and stick aspect of it, because I mess up a lot and it's nice to know you won't damage your walls having to take it down to redo it. Oh that is so adorable!!! I love all the Peel and Stick Mickeys! I would love to use something like that in our bathroom. That is so cute! We love Mickey and would love this in our house! that is the cutest bathroom. I have mine in a woodsy theme but if i ever have a second bathroom i want something fun like this.